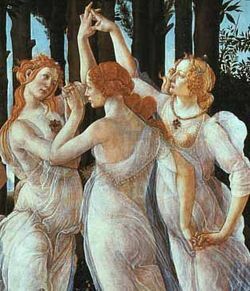 The Three Graces, here in a painting by Sandro Botticelli, were the goddesses of charm, beauty, nature, human creativity and fertility in Greek mythology. Fiction (from the Latin fingere, "to form, create") is the name given to imagined events, people or places and stands in contrast to non-fiction, which refers to factual claims and reality. Fictional works may include or reference factual occurrences. The term is also often used synonymously with literature and more specifically fictional prose. In this sense, fiction refers only to novels or short stories and is often divided into two categories, popular fiction (e.g., science fiction or mystery fiction) and literary fiction (e.g., Marcel Proust or William Faulkner). Fiction is largely perceived as a form of art and/or entertainment, although not all fiction is necessarily artistic. Fiction may be created for the purpose of educating, such as fictional examples used in school textbooks. Fiction is also frequently instrumentalized by propaganda and advertising. Fiction may be propagated by parents to their children out of tradition (e.g. Santa Claus) or in order to instill certain beliefs and values. Fables with an explicit moral goal are not necessarily targeted at children, however. Fiction may over time blend with factual accounts and develop into mythology. Many atheists perceive religion as no different from any fictional tale, whereas members of religious groups typically explain their beliefs with faith and/or historical figures/events; and claim they are fundamentally different from fictional tales (although they may call other religious views fictional). The sociological school of constructivism argues that every view of reality is fundamentally a construction of the self and that a safe distinction between fact and fiction is impossible, whereas the philosophy of naturalism holds that reality can be approximated and truth can be demonstrated through usefulness, allowing the distinction from fiction. The Internet has had a massive impact on the distribution of fiction, calling into question the feasibility of copyright as a means to ensure royalties are payed to copyright holders. Also digital libraries such as Project Gutenberg have come into being which make public domain texts more readily available. The combination of inexpensive home computers, the Internet and the creativity of its users has also led to new forms of fiction, such as interactive computer games or computer-generated comics. Countless forums for fan fiction can be found online, where loyal followers of specific fictional realms create and distribute derivative stories. Through open writing systems like wikis, collaboratively written fiction is also becoming possible (see the Wikifiction initiative). Fiction is a fundamental part of human culture, and the ability to create fiction and other artistic works is frequently cited as one of the defining characteristics of humanity. Narratology is the theory and study of narrative and narrative structure and ( ) the way they affect our perception. The term was coined in French, narratologie, by Tzvetan Todorov in his 1969 Grammaire du Décaméron (Prince ). Its objects of study are all kinds of narrated texts - both fiction (literature, poetry, etc.) and non-fiction ( historiography, academic publishing, etc. ), - as well as the dramatic structures, plot devices, characterization, settings, genres, and literary techniques. Usually, the term "narratology" is used in connection with fictional texts, which doesn't imply that non-fictional texts or other forms of fiction ( theatre, films, electronic entertainment, etc.) are not included in the studies' field. point of view: the perspective of the narrator; usually refers to the voice, first or third person. tone: the tone of "voice" that the author uses.